Many, including myself, are obsessed with when Penguin 4.0, the real time version, started to roll out and when it will be fully done. Why? Because the impact has been somewhat minimal thus far. Although, Gary also said last night that the part where Penguin 3.0 recoveries are happening now and rolling out over the next few days. It turns out that part of Penguin 4.0 may have launched well before Friday, September 23rd. How far before? That is unknown. He said there are "several" parts to this and added that the date they used was based on the "most noticeable part." 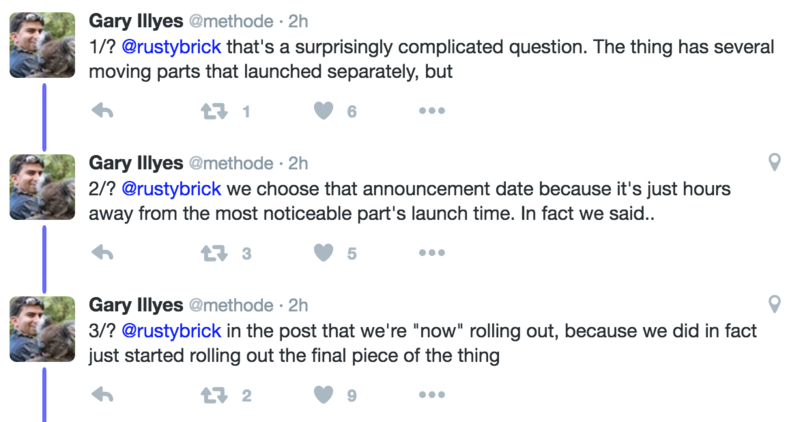 The date they launched it he said was when "we did in fact just started rolling out the final piece of the thing." So I guess the other parts were before the 23rd then. So what we do know is that it is possible you saw Penguin shifts before the 23rd but again, the most noticeable part would have been after the 23rd. The interesting part of this, for five days after the 23rd, most SEOs didn't notice much at all. We also know that recoveries started just recently and will roll out over the next few days.